It’s time to see the Great Wold and the port city of Hull plus more in your East Yorkshire motorhome hire! Find motorhomes for hire in Bridlington, Beverley, Goole, Hessle, Driffield and throughout East Yorkshire county! Do you own a nice motorhome? Rent it out on Camperbug! Speak to motorhome lenders and hirers now! Situated in the north of England, the county of East Riding of Yorkshire is a ceremonial county which also bears the status of a unitary authority. The county is also known by its former postal county name North Humberside and as East Yorkshire. The hunters of the Paleolithic period followed the herds and moved through Europe and England. Owing to its abundant supply of resources and the Gypsey Race stream, the settlers chose the Yorkshire Wolds as their new home. The Great Wold Valley has served as an essential place of worship during the Neolithic and, some of these monuments still stand today, making it a great stop during your East Yorkshire motorhome hire. Following the Roman invasion of Britain, the Anglo-Saxon invaders established Christianity in the county, and the Iron Age cemeteries at Garton on the Wolds pay homage to the lost pagan rituals of the time. The struggle for control over East Yorkshire between the Anglo-Saxons and the Danish invaders ended in 867 AD when Halfdan and his Danish army captured the town of York. William the Conqueror claimed control of East Yorkshire in 1066 AD and subdued the defying earls in the Harrying of the North. The expansion of the railway system, the port of Hull and canals significantly improved agricultural trade and tourism in the region. Drop in at the art studios, vintage shops and delectable eateries at Old Town in Hull. Wilberforce House takes an informative look back at the dark years of transatlantic trade and how William Wilberforce persistent anti-slavery crusades helped abolish slavery in England. Savour film, photography and art at the former banana warehouse which is now Humber St Gallery or drink in the sights at The Deep aquarium which is said to be the most striking in Britain. Take in 14th-century architecture at the Beverley Minster church or study about Hulls 19th-century whaling fleet at the Maritime Museum. Have we got you excited about visiting the county of East Yorkshire? Then hire your motorhome courtesy of Camperbugs’ UK wide motorhome hire and lender services and get travelling! I am Auto-Roller 707, hire me today! A 7 berth motorhome, the Auto-Roller 707, is the ultimate family motorhome. 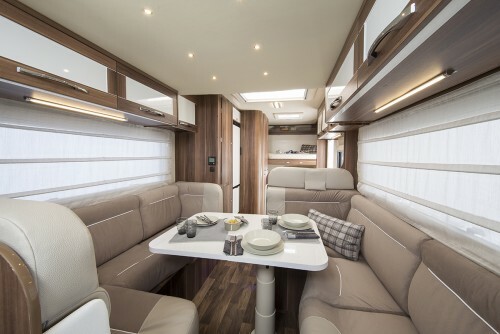 This motorhome consist of 7 comfortable beds throughout, including twin rear bunks, a drop down bed, and lounge beds. Whether you are traveling as a family or taking a group holiday, the large 707 motorhome provides everything you need. If you don’t require all the beds, the bottom rear bunk can be stowed away to create a large garage space, ideal for bicycles or sports equipment.